Last episode we discussed the start of the Arab Revolt in the Hejaz, modern day Saudi Arabia, and this week we will follow that revolt through to its end, or at least until its stopping point until the British began advancing out of Egypt. After we wrap up that story for the moment we will take a deeper dive into the life of a man named T.E. Lawrence, who you probably know as Lawrence of Arabia. Lawrence would become one of the most famous people from the First World War, especially after the release of the critically acclaimed movie in 1962. We will close out the episode with a quick overview of some of the changes in the British and French governments in late 1916 and how they would have a substantial effect on how both countries pursued the war in the Middle East and what they hoped to gain from its conclusion. Sharif Hussein had launched his revolt in early June 1916 and while this represented a shift away from the Ottomans, it did not create an insurmountable rift. Even while his revolt was ongoing Hussein always kept communication lines back to Istanbul and the Young Turks open. This was obviously an attempt to hedge his bets, just in case he needed to move over to the Ottoman side, just in case. In these conversations Hussein kept up his same basic set of demands, more power and autonomy within the Empire, and a heriditary title. The British were not initially aware of these conversation, but their estimation of Hussein and thier hopes for the revolt began to drop quite rapidly. Members of the Arab Bureau began to drop some very negative comments in their communications, like David Hogarth who would question Hussein's intentions “It is obvious that the King regards Arab Unity as synonymous with his own Kingship." Or Ronald Storrs who would say of Hussein that “his pretensions bordered on the tragicomic." Even while their belief in the revolt collapsed the British still felt like they had to support it as far as possible, even if they now believed that it might fail. These were the same people who had so strongly pushed for the British to support Hussein, so they either had to admit that they were wrong, or blame something else, and they would always try to push it off to Hussein. Back with the revolt there were already serious problems. While Mecca had been captured, the next critical target, Medina, would be far more difficult to bring under their control. The Ottoman troops in Medina were fully prepared to defend Medina, and even felt that they were strong enough to launch an attack towards Mecca. The decision to attack out of Medina was driven by more than just military reasons, but also religious ones. The pilgrimage season would begin in early October and it would look very good for the Ottomans if they controlled the holy city of Mecca before that season began. For Hussein the situation was looking quite grim, there simply were not enough men under his command to achieve the necessary objectives. The British also could not just send him more troops. This was because the fighting was occurring around the holiest cities in Islam, which caused the Indian Government, who ruled over millions of Islamic citizens, to make very clear to the British government that sending infidel troops into the Hejaz to help the fighting could have serious reprecussions not just in the Middle East, but in India and the world. The only possible choice was to try and find Arab volunteers who were willing to be sent, but that would take time, and that was something that the revolt was very short of. The French were able to lend some assistance quicker than the British. In September the French agreed to send a military expedition to help the revolt, and this unit would be made up entirely of Islamic soldiers. These troops would be acceptable to Hussein, his men, and Muslims all over the world. The unit would be led by Lieutenant-Colonel Edouard Bremond, who would arrive at the port of Jeddah on September 20th. This military expedition would never ben large, with their numbers never reaching much more than a thousand men, but they provided much needed military experience and expertise. They were able to help train and equip the men that Hussein and his sons led, which made them much more effective. There was one problem that they could not resolve, and that was how to make up for the large numerical disadvantage that the men of the revolt would be forced to fight under. The strength of the revolt would soon be tested. The Ottoman forces did not get moving as soon as they had hoped but by late fall 1916 they began their advance. They moved out of Medina and surprised Hussein's troops, causing them to quickly break and retreat. They fell back to the village of Yanbu, near the coast, where they would try to defend once again. Here they would be assisted by five ships of the Royal Navy, while these ships were helpful, they were not he reason that the Arab troops stopped the Ottoman attack. By this point he Ottoman army was hundreds of miles from their base in Medina, hundreds of miles that was constantly being harrassed by Bedouin raiders. This meant that when they reached the village of Yanbu they wre a spent force and since they could not make any more easy progress their only option was to turn back to Medina. They were pursued by Hussein's sons and their troops and they put the city under siege. They could not actually attack the city, they did not have enough men for that, but by this point they were at least powerful enough to kep the Ottomans contained within Medina, for now. With the situation having somewhat stablized the British once again began to consider sending troops. After evaluating the situation they began to realize that the number of men required was not small, and the numbers that began floating around the Arab Bureau were in the range of 15,000 troops. This time it would be T.E. Lawrence, recently arrived in Egypt, would would advise against this action. He was especially concerned about the fact that Hussein was not willing to let the British land Christian troops on the Hejaz, and so any landing would be against his wishes. He would say that "If the British, with our without the approval of the Sharif, disembarked an armed force at Rabigh powerful enough to take possession of the groves and organize a position there [the Arabs] would, I am convinced say 'We are betrayed' and scatter to their tents." Along with local problems, Lawrence was also concerned about how such a move would look on a global scale, saying that "the appearance of British troops so near to the Holy Cities might antagonize the Moslem world and even the Arabs it was intended to succor." As an alternative approach Lawrence suggested that the British simply pump more gold into the region through Hussein, gold that he could use to hire more Bedouin soldiers. After considering all of this information the British decided not to send more troops, and with this decision the revolt went somewhat dormant. Capturing and holding Medina, and having the people of Medina join the revolt was almost a requirement to be able to continue its spread and to have a larger effect on the war. Medina was on the line of advance out of Mecca and into the rest of the Ottoman Empire, with it still in Ottoman hands the revolt was bottled up to the south. And so, the revolt just hung out for a bit. It would be some time before they would be involved with the war again, and only after the British had advanced out of Egypt, freeing the Arabs to move north and join the British forces, a conversation for a later episode. The opinions of the British diplomats in Cairo would see a very sharp shift from optimism to pessimism about the revolt in the six months after it began. This can be seen in the Arab Bulletin, which was an informational printing that was distributed to those within the Arab Buruea but also to high ranking politicians and military leaders from India to London. This was a relatively exclusive club, with only about 26 copies of each issue being printed. This bulletin was often published multiple times per week to keep everyone up to speed with events. In its very first issue there were already some concerns, voiced by Lawrence, about how the Arabs would hold together for the revolt, especially if and when things got difficult. By issue number 6 the Arabs, and their soldiering ability, were being deeply questioned. "They are presumably tribesmen only" and "They are all untrained, and have no artillery or machine guns. Their preference is for the showy side of warfare, and it will be difficult to hold them together for any length of time, unless the pay and rations are attractive." By early February 1917, when the 41st issue was released the revolt was almost entirely written off "the prospect of Arabia united under either the King of the Hejaz or anyone else seems very remote. The ‘Arab Cause’ is evidently a very weak cement in the peninsula; dislike of the Turk is stronger; and a desire to stand well with us is perhaps stronger still." The Director of the Arab Bureau David Hogarth would, in late May 1917, in a writing he considered a review of the first year of the revolt, write it off as a complete failure. The best that he hoped for was that they would hold their place and distract some Ottoman units. While much of this discussion revolved around how the revolt had completely failed, by early 1917 it was actually somewhat stable. The Ottomans were not in a position to push them back, and the British were more than happy to kick in a few million pounds worth of gold occassionally. Remeber, that is pound Sterling, not the unit of measure of a pound, the British and their money naming. Also, by 1917 a few million pounds sterling here and there was basically a rounding error in terms of total cost of the war, so it did not bother the British too much to ship some of it to Hejaz to keep their little pet project going. Really quick, before we move onto Lawrence of Arabia, a think a brief overview of why the Ottomans did not have the strength to push back against the revolt is in order. 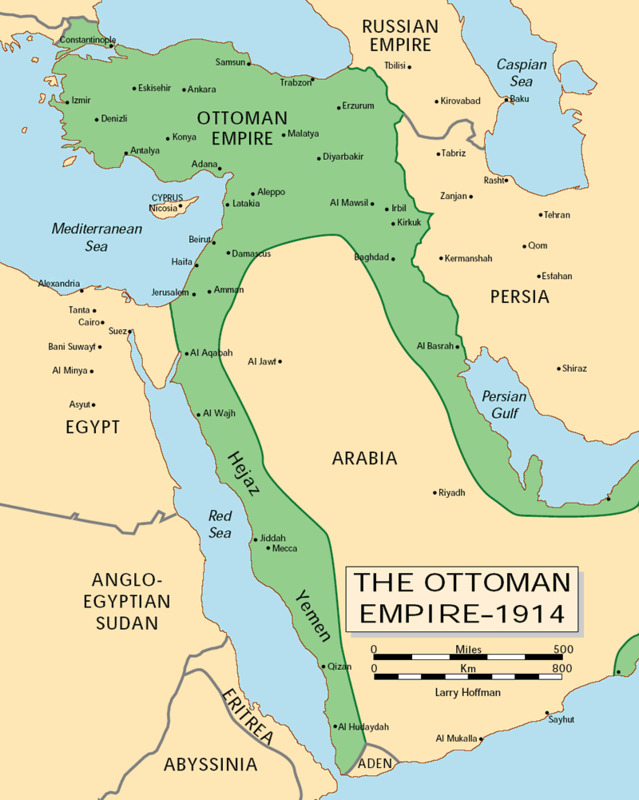 Some of this will be touched on in later episodes, but to understand why the Ottomans in the Arabian peninsula were so weak at this point in the war it is important to understand how many directions the Ottoman military was being pulled in by this point in the war. They had lost Baghdad in August 1916, which pushed them out of most of Mesopotamia. Then there were troops sent on the second Suez offensive, which occurred right before the start of the revolt, and these troops were beaten by the British and had to retreat. Then there were Ottoman troops sent to reinforce the Caucuses front as it buckled under pressure from the Russians. Then ther ewas also an expedition launched into Azerbaijan. On this expedition the Russian troops would retreat, pulling the Ottoman units deeper into the territory where they would stay for months. Finally, in late 1916 the Ottomans had sent 30,000 troops to help with the conqeust of Romania, which we discussed briefly in our Romanian episodes. All of these greatly geographicaly divergent objectives pushed the already stretched Ottoman army to the breaking point, and the Arab Revolt, comfortably bottled up south of Medina would also be low on their priorities list. We shift now to discussing a man who would begin the war as a young junior Lieutenant with the name of Thomas Edward Lawrence. Lawrence would eventually become something of a legend, made even more famous by the movie starring Peter O'Toole which was released in 1962. What he would become is of course not where he began, and before the war Lawrence was an Oxford student who would travel throughout Syria and Palestine to study the old castles that had been constructed during the crusades. Through these travels he would create his thesis, which would later be published and is still available for free on the internet at archive.org. These travels would give him some familiarity with the region and its history, which would play a role in getting him into the Middle East during the war. When the war began Lawrence was 28 years old and he joined the war office where he was put to work creating maps in London after he was turned down from army service due to his small size. By September 1916 Lawrence was in Cairo thanks to connections with David Hogarth, the head of the Arab Bureau, who he had worked with before the war. Through this connection he had been transferred to Cairo as a translator and given the rank of second Lieutenant. While at the Arab Bureau Lawrence was a relatively low ranking individual. He was able to create a friendship with Ronald Storrs and it was through this friendship that Lawrence found his way to the Hejaz. Storrs was going to meet the leaders of the Arab Revolt and decided to take Lawrence with him, which apparently was not a hard thing to make happen since Lawrence was not the most popular person in the Cairo office. Lawrence and Storrs would arrive at Jeddah on the coast and meet with one of Hussein's sons, Abdullah. Lawrence was not greatly impressed with Abdullah, but apparently Abdullah was quite impressed with Lawrence. This meant that Lawrence was allowed to continue into the interior to meet with another of Hussein's sons, Feisal. This meeting would take place south of Medina and it would be the start of a friendship that would last for years. Lawrence thought very highly of Feisal, and believed that he should be the leader of the Arab troops. After this meeting Lawrence returnd to Cairo with a proposal. He believed that instead of launching a large military campaign, and fighting in the traditional style, the Arab Revolt should double down on a guerrilla campaign. This would have the benefits of sapping Ottoman strength while also playing to the strengths of the Arab and Bedouin soldiers. Lawrence also wanted Feisal to lead this effort, and he wanted to be sent back to act as liaison to arrange necessary British support. When Lawrence proposed this to the British officials in Cairo they were initially very open to the idea. This was around the time that they were estimating that it would take 15,000 British troops to secure a traditional military victory, and the Arab Bureau di dnot have the sway to arrage for that number, so Lawrence found it easy to secure support for anything with any hope of success. Lawrence would leave Cairo again on November 1916, and he would be with the revolt by early December. For the rest of the war Lawrence would work beside Feisal and the Arabs, and he would be responsible for turning British gold into greater Arab support. Lawrence would describe the tactics of the revolt like this "Our tactics were always tip and run, not pushes but strokes. We never tried to maintain or improve an advantage, but to move off again somewhere else. We used the smallest force, in the quickest time, at the farthest place. In the action had continued till the enemy had changed his dispositions to resist it, we would have been breaking the spirit of our fundamental rule of denying his targets." He would emphasize that "the Arabs should never try to maintain or improve an advantage. They ought to move off again somewhere else...If the action had continued till the enemy had changed his dispositions to resist it, we would have been breaking the spirit of our fundamental rule of denying him targets." Lawrence would suggest to the Arabs that instead of trying to capture Medina directly they should instead move around it and threaten the rail connection between Medina and the rest of the Ottoman empire. They would do this, and their constant raiding caused the Ottoman commanders in Medina to have to use troops to defend the railroad which would eventually reduce their supplies to the point of impotence. Lawrence would also put a heavy emphasis on expanding the base of support for the revolt among the people. He believed that it was critical for the revolt, and these efforts would pay off. It allowed the Arabs to have exact information about the make up and positioning of the Ottoman troops whenever they setup for the attack. It also allowed for Lawrence and Feisal to feed the Ottomans false information about their strength and intentions. This campaign which Lawrence played a role in leading would not be war winning by itself, but it proved to be greatly valuable to the British effort as a whole. With never more than a few thousand men the Arabs would occupy around 20,000 Ottoman troops. These troops would be distracted and pinned down south of Damascus, but east of the critical Palestine campaign being launched by Allenby and the British in mid 1918. It is likely that if these troops were available to the Ottoman defenders in the Palestine that the British campaign would not have been as successful as it would be. Over the course of his time with the Arabs Lawrence would become friends with them. In his correspondence he would begin to use words like "we" to describe them, not them or they. he believed that the Arabs should be free after the war, but he also knew that the British were deceiving them. He knew that the British and French were hoping to give the Arabs at best nominal autonomy in the post war world. Even with this knowledge Lawrence would continue his fight for them, even at Versailles, which we will discuss in a later episode. This has been just a brief overview of Lawrence, there are obviously much deeper histories out there, and this is a topic that I may revisit in greater detail in the future. To close out today we shift our focus out of the Middle East for the moment, and instead to Paris and London. With British and French support so critical to the revolt, and British military campaigns critical to removing the Ottomans from the war. In London the impactful change would come in late 1916 when Lloyd George replaced Asquith as Prime Minister. Asquith had been at least somewhat against large territorial acquisitions in the East, but Lloyd George fully supported them. He was not a fan of the Ottomans, and believed that breaking up their Empire, with the British receiving their share, was the best path forward. These views would soon clash with Wilson's after the United States entered the war. Both of the leaders wanted the Ottoman Empire broken up, but where Wilson wanted self-determination, Lloyd George wanted something close to colonialism. Where Wilson wanted peace without annexations, Lloyd George would push for the opposite, but he would not do so openly or alone. During the last two years of the war Lloyd George was, if nothing else, a smooth political operator. He would shroud his true intentions from the Americans, telling them what they wanted to hear, and save his play until after the war. There would also be changes on the French side with the appointment of Premier Clemenceau in November 1917. Clemenceau really hated Germany, like really really hated Germany. As victory seemed to loom he would push for greater and greater punishment for Germany, as for the Middle East, he did not care quite as much. Up to his appointment the french had been fixated on Syria, but Clemenceau was not nearly as concerned about territorial acquisitions in the Middle East. Would he take them? Sure, because he knew that there were some in the French government who greatly desired them. However, he would gladly trade them all away to the British as long as they supported the strongest possible peace terms against Germany. This view left the British clearly in the driver's seat in the Middle East. It is impossible to discuss the Middle East during and after the war, and especially when discussing the Western view of the area, without a word about Zionism. Zionism, at its simplest, is the idea that the Jewish people needed a country of their own. This movement would change when Theodore Herzl, an Austrian, pushed for a Jewish State in 1896. There had been discussions about finding a more secure place for the Jews somewhere in the world for over a century. These discussions came from a variety of places, from Jewish settlements in Palestine, to the British statesman Benjamin Disraeli, to Moses Hess. Herzl's contribution to the movement was the idea that the goal of the Jewish people should be to push forward a political movement to gain the support of the governments around Europe for the creation of a Jewish state which would be created by political maneuverings. Herzl would die in 1904, far before the Zionist movement would see its goal fulfilled. There were many influential Zionists in British politics both before and during the war. The most important of these was none other than Lloyd George himself. The specific location of this desired homeland was not always the future location of Israel, and instead there were several different areas considered, from Uganda to South America. However the movement would slowly, and then much more rapidly after Herzl's death, begin to coalesce around Palestine being the most appropriate place. The movement would eventually culminate in the Balfour Declaration of 1917. In this declaration, issued officially by the British government, would be the following statement "His Majesty's government view with favour the establishment in Palestine of a national home for the Jewish people, and will use their best endeavours to facilitate the achievement of this object, it being clearly understood that nothing shall be done which may prejudice the civil and religious rights of existing non-Jewish communities in Palestine, or the rights and political status enjoyed by Jews in any other country." This made the creation of a Jewish State, which decades later would become Israel, an official policy of the British government, and this policy would have consequences not just during the war, or immediately afterwards, but over a century later.